Remember constructing epic forts of blocks and blankets in your youth? Generation after generation celebrates the tradition of assembling these quilted behemoths, guarded by secret passwords. Building forts from blankets and teepees provides hours of imaginative play to your junior all-star. Also, it gives them a safe and fun place of their own for hiding or reading. 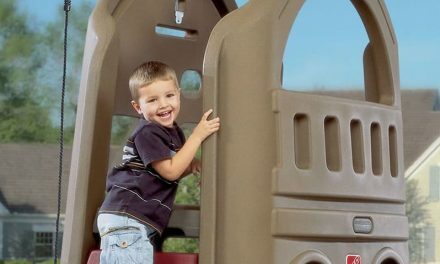 Play tents for toddlers add an inexpensive and durable play area to any fort. They have an entrance and a window for protecting the flank. For fun in the sun, check out our Step2 Climber Guide and outdoor pop up canopies. 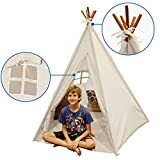 Let’s look at some of the children’s play tent and teepee ideas on Amazon to find the perfect hideout for your next fort. 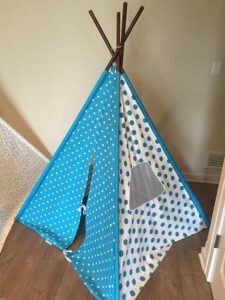 The teepee tent structure makes for a sturdy and fashionable play area. Designed with the wisdom of our native ancestors, the Classic Indian Play Tent has five wooden poles for a wider play area and stability. The poles stand 6 feet tall, offering headroom for the tallest toddler. 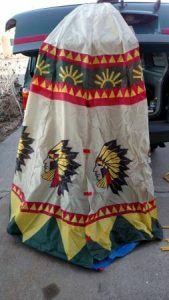 The polyester fabric doesn’t block much light, but war paint stains wash off easily. This play tent assembles easily by sliding the poles through sleeves in the fabric. Then, the wood ties at the top. Some creative parents add a fun twist to this play teepee for children by lining the poles with LED lights! And when not in use, the whole toddler teepee set folds into a convenient canvas bag. This indoor and outdoor best seller will make your little all-star feel like royalty! 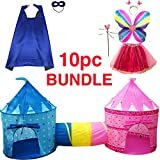 The Playz Sunroof Princess Castle has a castle play tent and detachable tunnel. Children can even assemble the pop up tent by just unraveling it. It also comes with a carrying case for quick storage. Children from 3 years old to 10 will compete for hours to see who is king (or princess) of the castle. The light mesh and sunroof make this play tent ideal for indoor or outdoor play with pets or imaginary friends. An intrusive dog might become an evil dragon! Some parents add play balls to the tent area. As another idea, you can use this play tent as the entrance to a bigger fort, with the connecting tunnel opening to the bigger secret lair. BOYS & GIRLS BUNDLE! BOTH TENTS INCLUDED - Children love playing with our premium his and hers tent set! BUTTERFLY WINGS, MAGIC WAND, HEAD BAND TIARA, TUTU SKIRT DRESS, BOYS CAPE & MASK ARE NOW INCLUDED! Excellent christmas or birthday present! PRINCE & PRINCESS APPROVED - Soft fabric & breathable mesh design allows for a safe & environmental friendly playground for the kids. Playz toys meet & exceed all USA CPSC Toy Safety Guidelines. KIDS TENT WITH PIT BALLS Purchase with Playz Pit Balls under ASIN B07C5F2TNG and use the fun play set at parties, picnics, backyard BBQs, parks, playgrounds, day care, school, carnivals, sleepovers, or simply keep it in the playroom at home! Great for dogs, cats, pets as well. 100% MONEY BACK GUARANTEE - Do your research! When you purchase a Playz product, you know the premium quality you will get. We care about ours kids, so don't settle for anything but the best! For the creative architect all-stars, put the Tinker Toys and Legos aside for life-size customization! Crazy Forts brings us this all new set for next-level fort building. 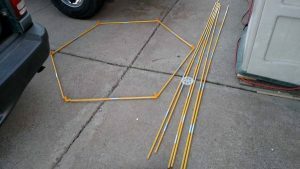 This set consists of 44 bright plastic sticks and 25 connector balls. The balls and sticks easily connect together for endless fort shapes. Just drape a blanket or sheet over the final result to have a fully-customized play tent. Crazy Forts play tents can fit in any space, and complete missing sections of mega forts. If you want to add on, simply buy another set and keep connecting! 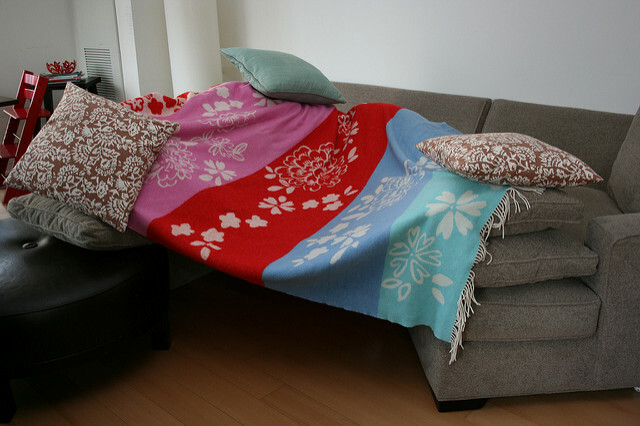 Cover the finished frame with a bedsheet or your favorite all-purpose blanket. Crazy Forts also sells a glow-in-the-dark play tent set. And because the pieces easily come apart, storage is also a snap until it’s time for an even bigger fort. Add on more sets for even more fun! For a completely different take on children’s play tents, check out the advent of bed tent playhouses. Bed tents go under the mattress and canopy over the bed with two tent poles. All you need is a bed, and voila! a place of peace of security. Pacific Play Tents has cornered this product with great versions like the Kids Secret Castle, Kids Cottage, or Kids Treehouse. Parents love how their kids settle down to sleep or play peacefully in their bed tent playhouses! The convenient fit of the tent around the mattress means that kids use their same sheet set and bed. Mesh panels and little peep holes allow good airflow. Now your little all-stars will love going to bed so much that your only challenge is getting them out! If every man is a king, then it’s no wonder that every kid loves a good fort. Forts provide feelings of independence, creativity, and security (Nerf guns sold separately). 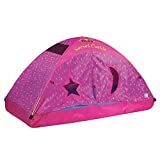 We have outlined and contrasted 4 fun fort-building items available on Amazon: an Indoor Teepee Tent, a Princess Play Tent, a Creative Fort Set, and a Bed Tent Playhouse. Hopefully this inspires you to gather all the bedsheets, quilts and pillows you can find and go make some memories!